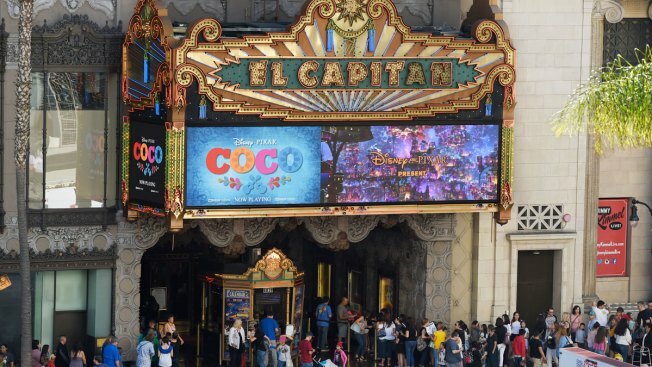 In this file photo, crowds line up at the El Capitan Theatre on Hollywood Boulevard for a screening of the Disney Pixar film "Coco" on Wednesday, Nov. 22, 2017, in Los Angeles. Her hair is pulled back, exposing gray locks on her black hair, especially on the right side of her face. Her eyes are brown, so is her skin. And now people go to her small town in Oaxaca, Mexico, to take pictures with her. Estela Fabian Mendoza welcomes them wearing an array of colorful aprons, just like her apparent animated alter ego, Elena Rivera, the loving-yet-cranky grandmother in Pixar’s latest hit film. The physical resemblance between this Mexican grandmother and the Abuelita character in Pixar's "Coco" has led people to believe she inspired the role, even if Pixar has yet to confirm the connection officially. "Coco" draws inspiration from Mexico and its people. In the case of Abuelita Elena, the Oscar-winning animated film got Fabian Mendoza, a 65-year-old Mexican cook and grandmother of nine, down to a T.
“Do I look like her? Well, yeah,” giggled Fabian Mendoza, telling NBC that she sees herself in Elena and the way she does her hair, stylizes her outfits with a colorful apron, and the way she walks. “The one thing that is not like me, is [Elena’s] bad mood,” said Fabian Mendoza. Following the release of "Coco," Mendoza said she was the last one to find out that she “was in the movie.” Her boss Jacobo Angeles approached her with someone she couldn’t recognize saying, “She is the one that appears in the movie.” Surprised, she remembers asking if they were talking about her and they said, “Yes, you’ll see. “So, when I watched I learned it was true,” she said, laughing. Fabian Mendoza has worked in the kitchen of Taller Jacobo and Maria Angeles for over 17 years cooking mole and stews for the shop’s employees. The shop, located in the picturesque town of San Martín Tilcajete in the Aztec region of Oaxaca, Mexico, was one of the location sites that the production team visited during the creative process, according to a local community organizer. Eduardo Garcia Luis, who described himself as the culture coordinator at Taller, said the first time Pixar producers visited the small town was about seven years ago during Shiin Naa Lasn, or Festival for the People, where locals celebrate the town’s gastronomy and artisanal heritage. The festivities take place for a whole week around Nov. 1, the Day of the Dead, which captivated the attention of producers. For years, the team behind "Coco" scouted the shop around Día de los Muertos. Garcia Luis said producers were fascinated with the shapes and bright colors of figurines known as Alebrijes, which the shop makes. And, even though these wooden animals and mystical creatures have no connection to the Mexican holiday, they were presented in the movie as spiritual guides that transcend from the world of the living to that of the dead. Garcia Luis even believes that Dante, the scrappy dog in "Coco," could also have been inspired by the shop’s Xoloitzcuintlies, a Mexican breed thought by Aztec mythology to be sacred. Pixar has not confirmed if the Mexican grandmother inspired the look for their iconic character. They have yet to respond to requests for comment. "Coco’s" directing animator Nick Rosario has said his grandmother-in-law, Pueblito Guzmán, served as a model to help make the film, helping nail down gestures and facial mannerisms. Fabian Mendoza said she doesn’t recall Pixar’s visits because of the many people who come and go. In the meantime, she is enjoying the attention she’s gotten from the shop's visitors. They come looking for her to take pictures with the real-life Abuelita from the Pixar movie. “I felt happy to see the movie because I never imagined this could happen,” said Fabian Mendoza.